I would like the experts here to suggest me a good receiver for this setup. I am having a budget of $400 to $500 and looking for a 7.1 ch. I am willing to answer further questions to the best of my knowledge. Apologies for being not enlightened enough when it comes to receivers. Thank you for all your kind help and i will sure update on how i am enjoying the sound once i set it all up ! Technically, you can't hurt the speakers by "underpowering" them, but you can hurt them by cranking an underpowered receiver too hard into distortion and clipping. A lot of people here power their speakers with less than 20 watts. Just listen for distortion and you should be fine. So, what I'm trying to say is don't worry too much about power output. Most people are completely satisfied with 50-100 watts. I'll let others recommend receivers for you, as I haven't been keeping up with the latest models. OP, the more clean power the better. are you opposed to refurbished units? do you need 4k pass through? atmos ever in your future? Already some good advice in here. Many here, including myself, have had great luck with buying refurbished receivers from Accessories 4 Less. I came here to post the same question however since I found your thread I'll post here and tag a line if you don't mind and actually talk about receivers. I have done tons of research so far and still hesitating to buy something then deal with the return so I'm still here, my problem is the same as yours power, I have been reading about how you have to at least meet the nominal power not the peak and since the floor ones are 150W that mean I have to get something that will provide 150 each channel but the most I have seen is around 115ish, now do we have to get an extra amplifier? Or like it was mentioned before a 100 watts will do it, keep in mind I WANT A REALLY GOOD QUALITY sound, I am not a pro no an audiophile by any mean but I do appreciate a loud and clear sound for music or movies, I don't have a set budget for a receiver but I'd like to stay below 1k, I want 7.1 set with all the wireless capabilities, and atoms is in mind but not a necessity right now but I'd like to get something with potential since I like to upgrade. One more quick question, since the R-14m power is 80watts how it's gonna stand the 100, is the system designed to distribute power differently.. This is my 1st time collecting my home theater and I am not inclined in what audio world has to offer these days.. Thank you and again sorry for jumping on here. Any input is appreciated so please don't hesitate. Many avr's have more than enough power for these HT's mention in this thread. As for surround speakers with a lower power RMS, having an avr that can deliver more than the RMS power is not a problem. 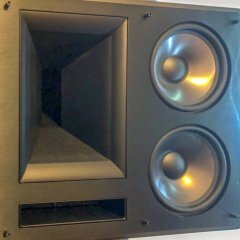 I ran some Klipsch surrounds(50 watt/200 watt) off a 200 watt power amp. I have also used a 100 watt Sony avr with my RF 7's. In other words there is a wide range in avr/amp power selection that can be used safely. It's not so much the amp but, the person on the gain knob. I recently brought a 45 watt amp for my RF 7 II's which are 250 RMS/1000 watts peak. 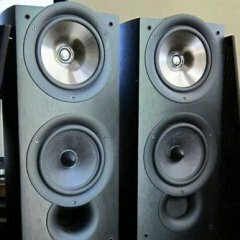 None of the Klipsch speakers mention in this thread are that hard to drive or that power hungry. With that being said and after my continuous reading about avr's and speakers I came to a conclusion that any avr with 80-100 watts will do fine, I am down to choose the specifications and I think a 600-700 dollar receiver will have more than what we need for now..
HT can demand more power from an avr than simple 2 ch. We were talking about watts, all avr's don't deliver their rated power. Some are 100 watt 2 ch driver at 1 kHz other will deliver 100 watts per ch with 7 or 9 ch driven. In this example it may only deliver 30 or 35 watt all ch driven. The best bet is to buy a major brand that is at least mid level. Pioneer, Onkyo, Denon and Sony are decent brands depending on budget. Also an avr with pre-outs allows for an amp to be added down the road if more power is needed. You should really try to forget about the amount of power. Just try to find an AVR that has the features you need and has good reviews for sound quality. That Denon will drive those speakers just fine. Congratulations on the purchase and let us know what you think when you get it all hooked up! Thank you, I will def be doing that. So here I am , a little silly boy in Christmas can wait to get his toys and finally I get my denon3200 and spend most my after noon setting everything up and figuring out all these new techniques that I had not experienced, I come to the speakers test and first one which is front right make the sound of choked speaker, there isn't and music type sound coming out but the rhythm is like what the music playing except it's chocked dotting sound just like a blown speaker, I don't know to explain this any better, any how, I switched the wires just to see if my speaker is bad but nope, speaker is fine, it was the channel was faulty, I research for hours and try to fine a way to fix it and even after so many resets for the unit, factory resets, still the same, I kept it playing just to get use to the configurations and ll that, the unit start shutting off, going on standby mode, so here I am pissed of, disappoint angry boy calling amazon..long story short, I got them to do immediate refund, free return, purchase the new model 3300 for less than $700 so another 200 on top of the bad unit but, BRAND NEW... never ever buy a used electronic never, it was my first and last time will try to save couple hundreds in such long term investment.. so since I live in Italy and mailing address is APO, I have to wait another couple weeks to get my new Denon.